Ross, Lt.-Col. Thomas, Accountant of Contingencies, Finance Department, Ottawa, was born at Montreal on the 8th July, 1821. His father was David Ross, Q.C., and his grandfathers were both officers in Highland regiments. His paternal grandfather was in the Montgomery Highlanders, and he settled in Qubec in the year 1760. Captain Fraser, his maternal grandfather was captain in the Fraser Highlanders, 78th Foot, and was present at the taking of Qubec in 1759. This officer became seigneur of St. Gilles de Beaurivage by purchase. Our subject’s father was a very able lawyer, and a worthy man, and his mother was a woman of superior culture. Her acts of charity live after her. She was the principal founder of the Montreal Protestant Orphan Asylum; and was one of its office bearers for half a century. Our subject was educated in Montreal, by the Rev. Dr. Black and the Rev. James Ramsey. The school kept by Dr. Black was opened in 1829. The family consisted of five sons and four daughters. The majority have passed away, having been useful in many ways in their generation. On leaving school his inclinations were for a military life, but the fulfilment of his desire was impractable. However, he was bent on having as much military life as possible, and immediately on leaving school, in 1838 he joined the Montreal Rifles as a private. Here he remained until the corps was disbanded in May, 1839. The rebellion in Lower Canada was the cause of the embodiment of this corps. In November, 1839, he received at the hands of the late Sir Dominic Daly, a clerkship in the provincial secretary’s office, Lower Canada The office was in Montreal at that date, but he became a permanent officer of the department on the union of Upper and Lower Canada, in 1841. He removed to Kingston in May, 1841, and remained there until May, 1844, when the seat of government was removed to Montreal, and there he lived until autumn of 1849, when, on the alternative system, the government was removed to Toronto. He abode in Toronto and Quebec, alternately, until November, 1865, when the government was taken permanently to Ottawa. His promotion to the different grades in the office took place in 1842 and 1858, when he bacame chief clerk in the secretary’s office. In 1870 he was transferred to the finance department under the control of Sir John Rose, bart., K.C.M.G. Under his auspices Mr. Ross carried out the formation of the stationery office, which has proved a great success in a financial point of view. His service has now extended over a period of forty-six years. With the exception of G. Wicksteed, law clerk of the House of Commons, he is now the only clerk in the civil service who went to Kingston in 1841, from Lower Canada. Mr Ross’s military career has been as follows:- Private and corporal of A Company, Montreal Rifles, 1838 and 1839; lieutenant and acting adjutant general, Montreal Garrison Artillery, 1844; unattached captain and major, 1846 and 1850; captain Quebec Garrison Artillery, A Battery, Active Militia, 1865; captain B Battery, Ottawa Garrison Artillery, 1865. 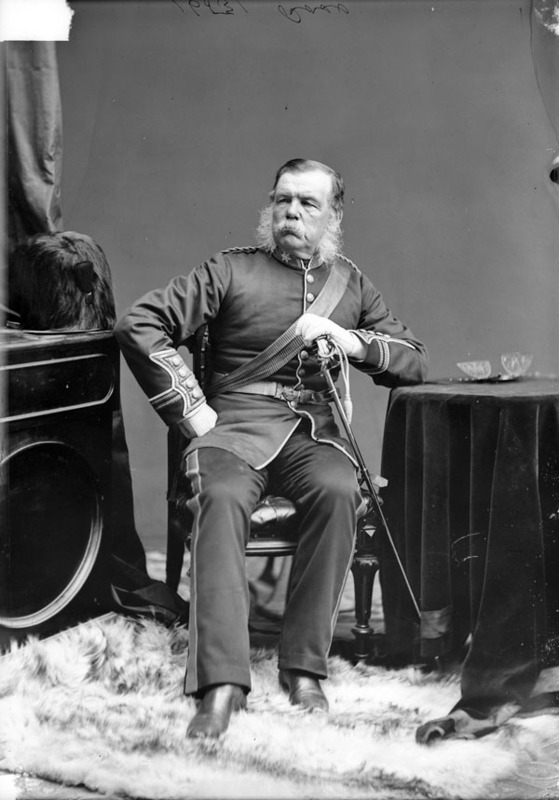 In June, 1872, he raised the Governor-General’s Foot Guards, of which regiment he is commanding officer, with the rank of Lieutenant-colonel. In 1885 he commanded the Wimbledon team. Lt.-Col Ross became a Freemason in 1843. He was grand pursuivant in the Provincial Grand Lodge of Montreal and William Henry, and afterwards at Quebec. He was grand secretary for the Provincial Grand Lodge, Quebec and Three Rivers. He ceased his connection with Freemasonary on the severance of the union between England and Canada. Lt.-Col. Ross visited Europe twice, and England on several occasions. From youth up he has been an Episcopalian. His first wife was Maria Sarah Macaulay, daughter of George Macaulay, son of the Inspector General of Hospitals Macaulay, who settled in Toronto after the war of 1812, and by this union there was one daughter, who is married to Dr. J. A. Clayton, a Cornish gentleman, now in the finance department. He was again married in 1863, to Ellen E. Creighton, eldest daughter of the late Captain Creighton, a retired officer, who had held commissions in the 81st and 70th regiments of Foot. In politics Colonel Ross is, and always has been, a Conservative. He is of a kindly heart, and has genial winning manners.